A man was recently busted for replacing custard powder with cocaine. We take a look at other failed attempts moving weight by camouflaging it with food. If you’ve ever considered transporting drugs across borders, don’t hide it in powdered custard. One Guyanese man already tried that one a few weeks ago, and he was put behind bars for lacing several bags of dessert with almost 18 pounds of cocaine. Godfrey Cassius, who was caught upon arrival at JFK from Georgetown, Guyana, checked in a suitcase filled with cocaine that carried a street value of around $300,000. 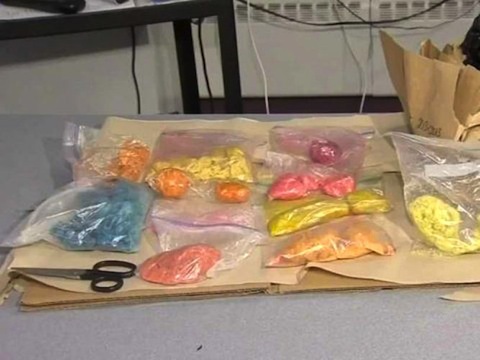 Not surprisingly, U.S. Customs and Border Protection found it rather suspicious that he had chosen to bring eight bags of powdered custard with him to New York City. According to officials, the bags “yielded a white powder which emitted a strong chemical odor,” and tests almost immediately confirmed that the bags were filled with more than just non-perishable custard. Stuffing foods with drugs and failing to get from A to B is nothing new—even the most innovative and bizarre schemes tend to end poorly. A Trinidadian man thought he was clever when he hid cocaine in frozen goat meat, and a college student tried to be sneaky by lacing candy with 40 pounds of THC. Both of them were caught. Here’s a look at some other insane ways people have turned foodstuffs into drug mules. 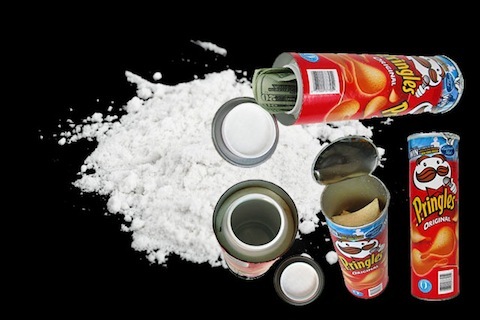 What went down: A New Jersey man came to the unfortunate conclusion that cylindrical Pringles cans would be the perfect way to conceal $2,500 of cocaine. The smuggler was pulled over by a Palisades Interstate Parkway police officer, who stopped his BMW because it had tinted windows and unclear plates. The officer searched the car and found a Pringles can with a false bottom, which he opened to find 48 grams of cocaine sealed inside two sandwich bags. 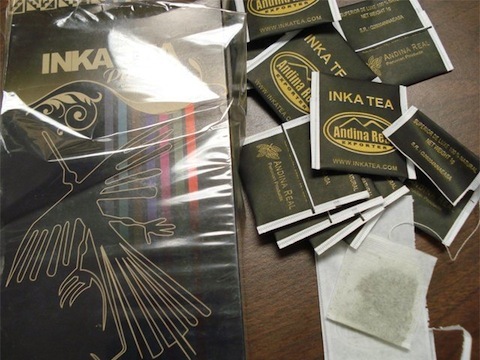 What went down: Homeland Security officers discovered a shipment of green tea bags from Peru that turned out to be more white than green. Two pounds of coca leaf products were destroyed in the seizure. 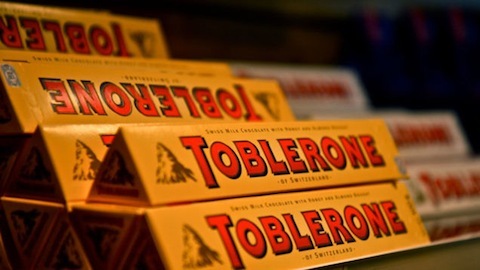 What went down: Filling Toblerone prisms with cocaine may seem like an impossible feat, but apparently it can be done. A woman was arrested after walking off a Caribbean Airlines jet with a bulging Duty Free bag stuffed with Toblerone chocolate bars filled with seven pounds of cocaine. 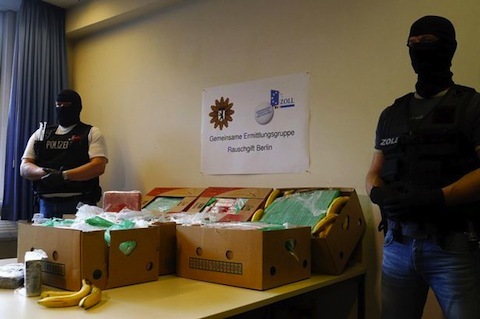 What went down: Employees at five Aldi supermarkets in Berlin were shocked to find 140kg (£5 million worth) of cocaine tucked into boxes of bananas shipped from Colombia. The drugs were discovered shortly before the fruit was due to be sold to the public. 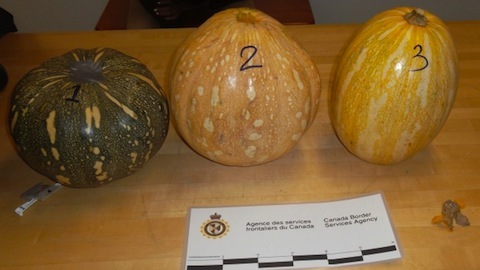 What went down: A woman was busted when custom agents at Montreal’s Trudeau International Airport opened her suitcase and found three pumpkins stuffed with approximately two kilograms of cocaine. What went down: A 24-year-old WCU student was suspended and ordered off campus after police seized more than 40 pounds of THC-laced candy from his apartment. 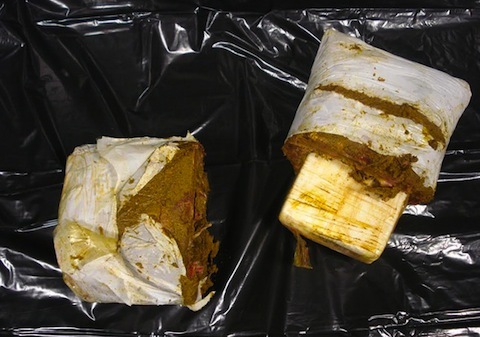 What went down: A Trinidadian man was held by U.S. Customs officers after he was caught carrying 7.35 pounds of cocaine inside frozen goat meat. The cocaine found inside the meat had an estimated street value of $1.2 million to $1.8 million. 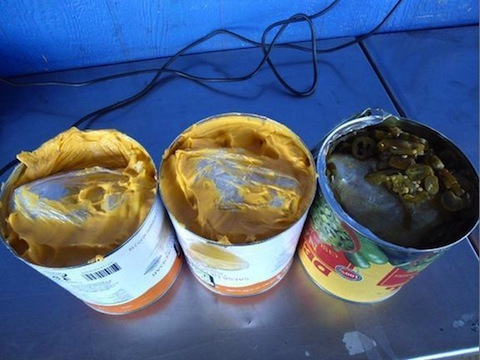 What went down: A smuggler was busted after attempting to cross into San Diego from Tijuana with cans of nacho cheese and jalapeños infused with methamphetamine. The drugs, valued at $140,000, were identified through an X-ray.